I continue to be amazed by the lack of understanding regarding copyright in the academic community. It's not that our universities don't try to get our faculty learned-up. You can go to any university web site and you will find extensive resources on copyright, and fair use. That said, I can also guarantee that with very little effort you can find many examples of copyright infringement on these sites. Universities don't have the resources to police their faculty and students, and as institutions of higher learning they have done a miserable job of teaching on this topic. That old saying comes to mind, "If the student hasn't learned, the teacher hasn't taught." (Siegfried Engelmann). So it is with interest that I read this study on the use of Creative Commons licenses and what options creators were most frequently selecting: The Creative Commons and Copyright Protection in the Digital Era: Uses of Creative Commons Licenses. The study found that for those allowing the creation of derivative works (82%), 71% were also requiring the share alike provision. Which means, if you want to use their stuff, you must license what you create using that identical license: derivatives allowed, and share alike. For most of us, where our institutions insist on a university owned all rights reserved license, the materials we create in the course of our work; e.g. instructional materials we are prohibited from using most of the great photos, videos, music, audio, texts, etc. that have been contributed to the commons. 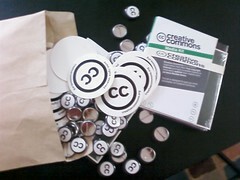 Most of this great stuff: 30+ Places To Find Creative Commons Media (thank you @jasonadamyoung) is off limits. When our institutions insist on restrictive, rather than permissive copyrights, we have effectively been removed from the conversation. This past week, another educator and I were trying to get an image from a state organization. One point of view was that the image was fair use if given credit, the other was that we should ask to see if we could use the image. When calling the gov. agency, they said you should always get permission because some of the pictures are from other non-gov. authors. They also asked us to use with permission with a link back to the site. This eXtension session on copyright covered some of these details, http://connect.extension.iastate.edu/p72653057/ -- what I remember taking away from this session is that you should essentially ask to use images/materials if there is any ambiguity about the use...which, I assume it about 99% of the cases, because unless you have a creative commons license attached or a lawyer sitting in the cube next to you, how would you know? Can anyone explain if there is really such a thing such as fair use,anymore? Good comments. I'm riding my bike this week and on my iPhone so I will be brief, but will comment some more when I get back on land. Fair use is an interesting topic. The way it us interpreted by our universities I don't see how it can be invoked for use in Extension educational materials. Perhaps in a blog but certainly not in products that will live on forever in Web space. For a glimps of what our universities will allow look at their policies for classroom use as compared to distance education. If access is limited (both in time and who can see it) then it's usually okay. Those limitations would rarely apply to Extension educational materials. I think for us to use CC material we would have to get permission in each instance. Of course, if we were to adopt a compatible licence for our products then this would not be an issue. It would depend on which CC license was attached to the work. If it was a CC 3.0 attribution you could use it. If it was share alike then you'd need permission. Of course, if Extension were to adopt a CC 3.0 share like license then you could use it. I know of no Extension service that is using this license, however. Some of our campuses are starting to use it with course materials. We need to see this extended to Extension materials.